Today I have a wonderful give away from my sponsor Becca at Sew Me a Song. 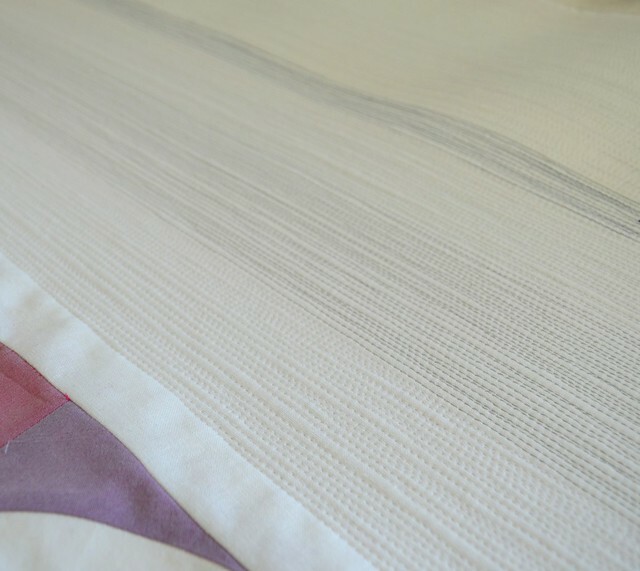 Look at the beautiful bundle of Japanese fabrics by Yuwa, Lecien and Diawabo - they are just perfect for a spring quilt. For those of you who don't know Becca's shop, I encourage you to go and have a look around - you can go now, but come back to enter the giveaway. She curates the most amazing collection of unusual Japanese and other fabrics, most of which I don't see at the other shops. I asked Becca a bit about herself. She began in the online fabric business with Peg as part of Sew Fresh Fabrics, but then her family moved to Maine. Becca's response was to start a new fabric shop and Sew Me a Song was born. Becca made a clear decision with Sew Me a Song to stock unusual and quirky fabrics not found in other shops. I sure think she has done that. 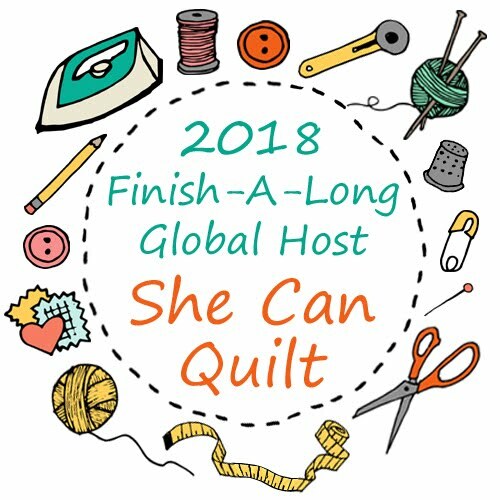 Becca connects with the online community through instagram and twitter (she is @sewmeasong) and she is a quilt guild member. She is excited to be expanding her shop space and is hoping to set up some in person sewing time there in the near future. I sure wish I lived closer to her so I could drop in. To win that fantastic bundle - thank you Becca - all you need to do is leave me a comment - please stick to one comment per person. Tell me something that you would love to see on my blog or what you like to shop for online or what is making you smile today. I will draw the winner randomly on Sunday morning when I wake up, get your comments in by then. And please make sure I can contact you. A number of you leave no-reply blogger comments on my blog all the time, and it is too bad because if you connected an email to your profile I would send you an email (probably late, but eventually it would come) in reply to your comments (except for giveaways as there are just too many for me to keep up) and we could get to know each other a bit better over time. But for a giveaway, if you are no-reply make sure you leave an email in your comment. If I cannot reach you I will just draw again. I'm pattern writing and matchstick quilting this week, and I have some bee blocks that must be finished tonight. The unquilted bit in that photo is about 1.5" to give you some scale and you can catch my progress on instagram too. Do come back on Thursday for Decipher Your Quilt - I will share the calculations behind 4 patch blocks, Jess will be sharing all about how to identify 4 patch blocks and many different varieties of them. We both have a practice project or block for you too. What sweet fabrics! Reminds me that fresh strawberries are just a couple months away. That definitely makes me smile! Those fabrics are lovely. Thank you for the chance to win. I follow you via bloglovin. I just found you site on Monday while looking for EPP blocks and quilts. This fabric would look amazing in fussy cut EPP hexies! I subscribed to your site because I like the blocks you make. I love all the things on your blog and they make me smile! Thanks for the giveaway. I love the aqua with the red and orange in your header! it looks great and I do not think I would have thought to put them together. arghhh, I'm so bad at comments! Not much is making me smile today, maybe when 6pm rolls round and I can go home! Lovely giveaway. Online is where I get to see so much fabric and supplies that are not available to me locally. Have a fantastic day! I'm hoping to go for a hike after I get off work. The sun is shining today and lately any day with sun (and no snow) is worth smiling about! I love shopping for fabric online although it often leads to overindulging in fabric purchases! Sunshine is making me smile today, especially since I can see water dripping from my roof. That means eventually the snow will be gone (emphasis on eventually), and that will really make me smile! Thanks for a great giveaway. 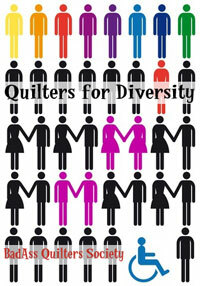 Love the fabrics and I am excited about the Decipher your quilt! I would love to see a tutorial on the matchstick quilting you are so good at. Those lovely strawberries are making me smile today. It's snowing a little and supposed to get down to -1 today. I shouldn't complain because we've had crocus peeking through and pleasant weather the last few days, but part of Spring is back to winter around here. That bundle is absolutely adorable. Thanks for sharing. Wowzers. Another fabric store. :) I wanna see more quilting on your awesome machine. You are so fun to watch. ♥ I love all you've been doing. Right now this giveaway is making me smile! I love these fabrics. Lovely selection of fabrics. Your match stick quilting always makes me smile. I'm going to try some one day because I love the way it looks. Also making me smile today are the purple iris' I bought in the supermarket yesterday. Then they were tight buds and now they're flowering. I am trying really hard to resist fabric, but that bundle is lovely - thanks for the chance. Love the strawberry fabrics! Thanks for the chance to win! beautiful fabrics! i like looking at all of your matchstick quilting. you have a very distinctive style and i enjoy reading your blog. I would love to see how you select fabric for your projects. Thank you for the chance to win some fun fabric. Love the fabric. We have had so much gloomy weather lately. So, to wake up and have the sun out makes me smile. Love strawberry fabrics!! I shop for fabric most online, of course! Wow your quilting! And a lovely little bundle of fabric. Thanks for a chance to win, that makes me smile! But I gotta tell you the little ole lady in the grocery store this morning with a big pink silk flower in her hair made me giggle, she was so happy and not afraid to live on the wild side with flowers in her hair! Too Cute, wish I had taken a picture. The snow is finally melting (it's in the 40's today!) and I spotted the tips of my crocuses emerging! This makes me happy today. Love the strawberry fabric too! I am a customer of Sew me a Song - ordered some fabulous low volume fabric from them. Right now, I am loving spring colors! Beautiful fabric. I love your designs and would love to see more tutorials. Thanks for the chance to win. HELLO, such a neat fabric giveaway+a very neat Shop too! The prior comment mentioned Hummingbirds and just reminded me that since we live in Montana, seeing these beautiful little creatures is a rarity! We have their "sugar-water" ready for them+laugh+enjoy their antics so much! Ours is the "Calliope"-too cute! My students are making me smile. Outdoor recess for the first time in a couple of weeks! Too much rain lately!! Would love to shop for chocolate but only if it could be delivered withing 5 mins!!!! Oh how I love your matchstick quilting!!! Hmmm - I guess I would like to see more of what you put on Instagram here in your blog as I don't have IG (yet)!! Lovely fabric bundle. I don't want to see you do anything other than what you are doing as it is always uniquely you. For fabric shops, unique is good too. Nice to see a shop stocking something other than the usual. Daffodils are making me smile today! They're so cherry and just sing spring--much like the fabrics in that lovely bundle. Thanks for the chance to win. Sunshine is making me smile today! I buy unusual fabrics online or fabrics that my local store has run out of. I've been enjoying your decipher the quilt series. I look online for inspirations and instructions; it's nice to see the two together in one! If only I had more time to DO all the things I learn about and get inspired by online! Love the match stick quilting. I want to try it soon. the thought of fresh strawberries makes me smile -- as well as those yummy fabrics. Thank you for the giveaway the fabric is beautiful. Oh wow! You are doing some close quilting there! These fabrics are so pretty and spring like! What we all need right now after all the snow everyone has been getting! I shop for sales a lot for the new fabrics. All I have here is JoAnn's and they don't carry the good stuff! Today the sun is shining - that makes me happy! I would love to here more about your matchstick quilting! I love to shop for fabric online and my little girl is making me smile today!!!! Thanks for the great giveaway!!! I like to shop online for unusual and colorful fabrics. HI!!!!! I do like fabrics that are different or maybe not being used by everyone!!!! I also like to blend fabrics of different lines!!!! carlaincrestwoodky@yahoo.com just in case....Thanks for the fun give away!!!! Meeting an old friend for lunch and catching up made me smile today as well as seeing the sun.....it has been a very long winter here in Southern Ontario, Canada. Thanks for opportunity to win the sweet fabric. I follow via email at 2bquilting247 at hotmail dot ca. Winter came late this year, and what made me smile today was a puppy playing in fresh, new snow for the first time in months! Very pretty fabric, I'd love to win it! ;) I love the new informational series, I am learning lots! Those pretty fabrics are making me smile. I'd love to make a table topper/runner to go with my California Strawberry dishes. Thanks. Lovely! I was just on Sew Me A Song stocking up on springy things! My favorite thing to shop for online is low volume fabric, I have an obsession! Lovely fabric Leanne, thanks for the chance to win! I love buying cute fabrics online! Oh even just browsing is amazing because I keep imagining what I would make with it! Strawberries and Japanese fabric are my favorites!! I shop at Sew Me aSong and love the prints she carries!! Thanks for a chance to win!!! Pretty fabric, but that matchstick quilting has me blown away! What to say....I don't have to work today so maybe I can finish cleaning and organizing the sewing room. A great shop and beautiful bundle! I'm smiling because it's my sons birthday today and I'm working on my last rose star, though that feels bittersweet! Well...it may seem a bit odd...but I am smiling today cause I just got a cortisone shot in my hip and it feels great right now...I'm even going for a short walk with Margret, my hot dog! :) And she'll be smiling too!! Fabric shopping makes me happy! I like it when people go in to real detail about what fabric and threads they are using, love your matchstick quilting and then it would be fun to learn what thread and needle size you use to do it. Thanks for the giveaway. I particularly like it when you blog about plain, bold colours where the quilting takes centre stage. What made me happy today? I pieced a baby quilt top with HST and all but two of my points matched. Happy, happy!!. I love to see your quilting!! Tanks for the giveaway. I like to soho online for fabrics of course as well as books, DVDs, and gifts. Love your quilts! Lovely fabrics! I buy most of my fabrics online, so I am happy to hear of another source to check out. Many thanks for the chance to win. Great blog. My children make me smile today. Those gorgeous fabrics make me smile, I buy most of my fabric online and will definitely be going over to sew me a song, thanks! I had lots of smiles today as I got together with two of my grandchildren for a craft day while they are on spring break. Lots of fun. Love browsing through Becca's shop! She does have such amazing fabrics. I was going to say that I'd like to see some patterns from you, but it looks like you are already working on that! Yay! Smiling at my cats basking in the sunlight, even though it is trying to snow! Thanks for this wonderful giveaway. Love your matchstick quilting. Thanks for the giveaway, it's lovely fabric. Such cool fabrics. What's making me smile today is my grandson just got glasses and he is so proud of them. He is 7. That boy has my heart. I've never owned Japanese fabrics before and this bundle is very sweet!!! Right now what is making me smile is that I am almost finished hand quilting a quilt for my neighbor who is celebrating her 80th birthday next month and I can't wait to surprise her with it!!! Eeeeeek!!! I love seeing your quilting, you are one very talented quilter. Love Becca's shop. Smiling today because I am so blessed! Just found your blog and it's great, so inspiring! Thanks for sharing a new shop today too! Who doesn't love these sweet fabrics. I went and visited Sew Me A Song, should have known to take my purse with me. LOL I see everything I want to on your blog, you always keep it fresh and exciting. Don't change a thing. I love to shop online for fabric -- I like it too much! I love to shop online for fabric and I love getting the daily email from Etsy to see all the fun things there. I follow via Bloglovin. very pretty fabrics-they would make a beautiful quilt. I think I could just eat that fabric, it's just so darn delicious looking! Muahaha, Sew me a song is my only regular fabric shop I use. I have things sitting in my cart, and I was having a sad day earlier and my husband said I should buy some fabric. I am now going to go buy fabric, so thank you for the giveaway and prompting! I have one more seam to put together my first bed size quilt (at least everything but the borders) and my daughter was helping me pin (she's 4)--that males me smile. Love the fabric! How cute!! Having the temperature above zero is making me smile! What pretty fabrics. Thanks for the opportunity. I look online for new and different patterns. Thanks so much for this awesome giveaway! I love detail and vintage character of these fabrics. And Becca's shop is full of wonderful eye candy. As for your blog, I would love to know how you go about working with color - both as you build your stash and as you choose fabrics for a quilt. I love your quilts, and I particularly like the green tones in your Scrappy Trip and your Giant Plus quilts. Thanks for the inspiration! I am a new quilter and have never left a comment for a prize before -- I have been quilting from old clothes and others scraps and would love some new fabric! Thank you for the give away, and for showing your beautiful quilts to the rest of us. What made me smile today is seeing my sons joy at seeing his birthday cake. I like to shop online to see the newest fabric collections but I tend to hunt around and purchase online for sales on fabrics that I liked from the older collections. Such cute and unusual fabrics, perfect for Spring. I love your matchstick quilting. It makes your quilts look divine! Just show us more photos and how you do it! I'm smiling today because I received a "Save the Date" from one of my dearest friends who is finally getting married. I've bookmarked several of your projects as inspiration and will pick one to make a quilt for their wedding gift. Thank you! I love the unique fabrics. Thanks. Pretty spring prints! Tomorrow it will be in the 70s here in Georgia and the sun is supposed to be shining. It will be a lovely day to be outside playing with my 4 year old granddaughter. That bundle of fabrics makes me smile. We are just starting to see strawberries in the stores here in CA. Yum!! I love this fabric would be great for my niece. The Match Stick is going on my to do list. My pet parakeet is making me smile today, like all days. He started saying, "Ready for breakfast?" this week, which surprised me because I only say that to him once a day. Little pitchers have big ears, even if the pitcher is a parakeet! I love that closeup pic of the stitching on your quilt. Always enjoy stitching that is colored as it really pops out! Wow, the close up of your stitching is amazing! I am currently trying matchstick quilting but it is not that dense yet. Thanks for the chance on the giveaway. Cute giveaway! My favorite thing to shop for online is fabric. Two kids under two means limited trips to my local quilt shops. It turns out that babies don't like to shop for fabric foe hours at a time. 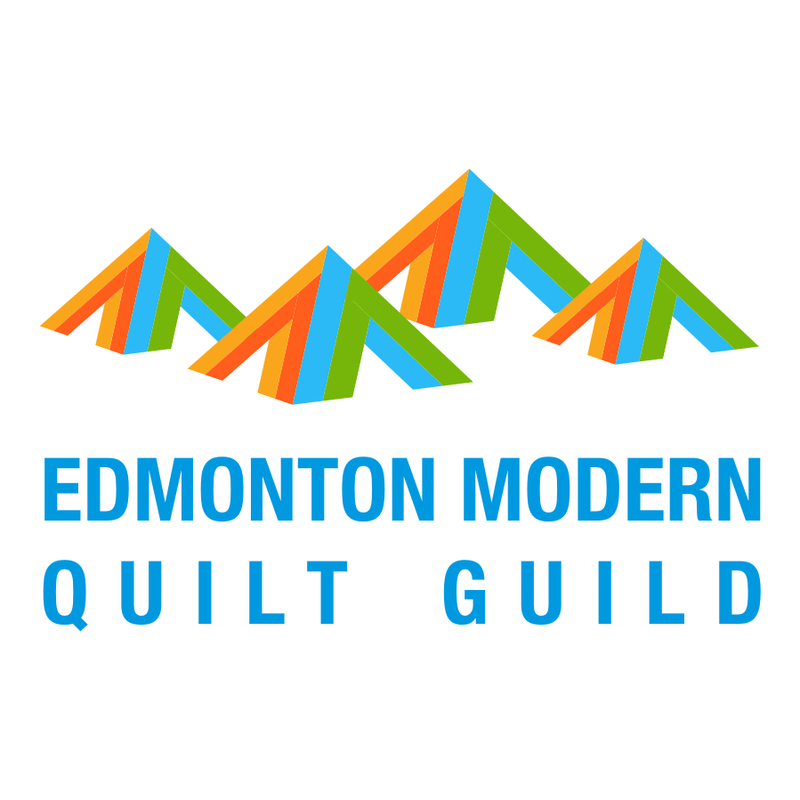 I would like helpful tips on quilting, tutorials, new gadgets, and unique fabrics. I enjoy your blog. Thanks for a chance to win. I love those strawberries! I do a lot of my shopping online and try to go mostly for FQs, because I love scrappy quilts. I rarely buy more than 1/2 of a yard. Thanks for the chance to win! There is nothing to change on your blog. I enjoy all your posts. I don't do much online shopping due to high postage which might be a good thing sometimes. What a beautiful bundle! I will have to check out her store. Thank you for the chance to win those wonderful fabrics. I have really been enjoying your posts on deciphering quilts. It's clear and easy to follow and very helpful. That's making me smile today! The sun is finally shining and it is a beautiful day! That makes me smile! Sew me a Song sure has a crazy, fun variety! I'm rather new to your site. I love your colour choices, piecing and quilting skills. Glad to have found you and thanks for offering up such a cute bundle. I love Lecien fabrics! I loved visiting Sew Me a Song's etsy shop. She has a great variety of fabric to choose from. Thanks for sharing about the Sew me a Song etsy shop- I love learning about new and unique fabric shops! Today, I am smiling because I am almost done the Stargazer quilt for my cousin's wedding. Since I cannot take my eyes off of your 'Reflections', I'd have to say that I'd like to see more like that! And your industrial quilting - the matchstick, LOVE it! Honestly, I look forward to visiting your blog on any given day because of the jewels that I find here! I my little puppy makes me smile.. She's just a lil sweetie! Oooh... just saw Newspaper in White from Objects by Robert Kaufman in Becca's shop. Love it! It makes me smile that spring is officially springing. Compared to much of the US, we have been blessed with mild weather this winter. Even so, many school districts have used more than thier pre-allocated weather days. Thanks for the giveaway- I am happy about sewing scraps today. I will be even happier if the wedding rings and coffee machine have arrived when I get home! Oh, I love Becca's shop (and I think I can credit you for turning me on to it a few months ago!). Lovely bundle - would love the chance to win it! Love the strawberries! After all the snow around here this winter - I am looking forward to spring even if in fabric! What a great bundle to win! Becca has some wonderful fabric in her shop that I have not seen in any other shop. When I can't buy fabric I love to just browse the shops online making a dream wish list, so many wonderful fabrics out there. Thanks for the great giveaway! I am smiling because for a change, I sat down to read some blogs and there you are, with a giveaway, how lovely. I also had a large quilt tumble dried today and it looks great. Your blog is always inspiring! And, thanks for this lovely giveaway. My dogs are making me smile today. And every day! I'm making them each a quilt. 12 more blocks to go for the first one . 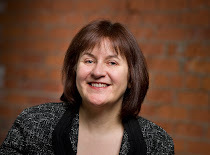 . .
What would I like to see on your blog? More of the same, please, as I always enjoy (and savour) reading your posts. Becca has such a great eye for fabric and her shop is wonderful! I'd like to see some of the sketches you might draw to explore an idea for a quilt, or the fabrics you pull and then pare down to the ones you actually use, or the inspirations for your ideas and designs. I'm interested in how your creative processes work. I have a small collection of strawberry fabrics (and even a pattern). Always looking for more - now I know where to look, thank you. I buy precuts mostly online because they are not available at my LQS. Thanks for the opportunity! I'm loving Decipher Your Quilt. Thanks for the creative series. Today we had warm, beautiful sunshine. After 3 cold, blowy days, it is the nicest day we've had since fall. Loverly. Thanks. I am new-ish to quilting and blog following. I am really enjoying both! Thanks for all you do to inspire and thanks for the opportunity to win. Fun fabrics and thanks for the chance! Im just lovin the matchstick quilting!!! I just figured out the no reply blogger thang. People can search for Venus Trapped (name of the blogger) who has a great tutorial for those of us caught in no-reply purgatory. It has to do with the fact that we entered blog land through Google plus. I am usually seen online as givbludplayhocky, but now that my no reply is fixed im, SewPsyched!!! My two yr old makes me smile everyday. The things that come out of his mouth! Those are very pretty fabrics. the spring weather is getting me in the mood for some dressmaking! I love the fabrics and they say "Spring" to me! Wow great blog. I found you through Quilty Folk who posted 20 Great Quilting Blogs. I will come back and spend some time here reading past blogs. I buy fat quarters and precuts on line. I just bought a template recommended on another blog. Love your matchstick quilting! And those strawberries remind me of cobblers - hmmmmm - what about a fruit cobbler quilt! Thank you for telling us about Sew Me A Song - I'm going to visit on line to see the unique fabrics. Thanks for the great giveaway. Thanks for the giveaway! I love to see what other quilters are working on and having the sun out for the second day in a row is making me smile and renewing my hope that spring is coming! I love this fabric---so "springy"! I am fascinated by the matchstick quilting. Can't wait to see the finished product. BTW, I love, love, love Sew Me A Song. It's a great place to find one of a kind prints. I love browsing her shop. Those are beautiful fabrics. Thanks for the chance to win! It's been cloudy and windy today and that's making me smile since it's a break from the usual heat and humidity (I live in Panama). I'm smiling today because tomorrow my 3 yr. grandson and i are spending the day together. Love the strawberry pattern! Made my first batch of homemade jam last summer and it was SO yummy! Hmm, I smiled today when I saw my two year old son and his new puppy wrestling on the floor and my son was giggling hysterically. Priceless! It makes me smile knowing you will be sharing more with us about learning to quilt on your new longarm! Thanks for the giveaway. The sunshine is making me smile today, not warm yet but it is suppose to be! Thanks for the giveaway! My new baby girl is making me smile, as she sleeps in my hands. Oh, I love those little strawberries! Thanks for the chance to win some....I'm on my way to see all the goodies in the shop now. I'm sure I'll be tempted! Just being on holiday is making me smile! I love Becca's shop - full of yumminess! Today I made it to the gym, and I smiled not cried, even though this is the first week I've done any regular excersise in years, hopefully it will stick, and I'll keep at it and get in a healthy routine, that still includes sewing. I've not made strawberry jam in years either, so if I do, I'd love to make some table accessories with this set of fabrics, to make me smile even more. Pass the clotted cream, do be a dear. Great vendor, beautiful fabrics, I'm smiling! I really like your matchsticking. It looks so modern. Sew Me a Song is fabulious, so many cute fabrics. I have a UFO - Kimonos - just thinking Japanese fabric makes me want to begin work on them again. I am gonig to post photos of them to my blog. I love blog hopping it always gets my creative juices going. Thanks!! Cross my fingers I win. I love to shop for fabrics online, especially hard to find prints. I'm always in awe of your matchstick quilting, just love it! And i'm glad you posted how you created your Reflections quilt, it's one of my faves! I'm really enjoying your Decipher Your Quilt series. Thanks! Hi. I love to shop for fabric on-line. I'm making quilts for my grandkids right now. They are what makes me smile. Thanks! Thanks for the lovely giveaway ladies! My selvage quilt made me smile today- I got the top together and I'm super happy with it! What things that are making me smile today are the leaves opening up on my trees and my daffodils blooming. Spring is here! These are such cute fabrics. I would love to see the quilt along on the reflections quilt. Yummy fabrics. Hope I'm not too late to join in.